Music and lyrics written by Matthew K. Heafy. All musical arrangement by Matthew Heafy and Travis Smith. Contributions by Travis Smith and Brent Young. re-release of 'Ember to Inferno'. After hearing Ember to Inferno, Ascendancy and The Crusade, I came back to this short cd and listened to it a couple times. The first 4 songs are on Ember to Inferno and basically sound exactly the same. So I won't really discuss it in detail, but they all have a basic metal feeling. Actually this whole cd sounds a bit different from any other band out now days. Metallica is an obvious influence they show on here. Most people hate Heafy's voice, on this cd, I honestly say it does not bother me the least bit. His singing voice is talented and is used for most of the choruses. It is pretty damn catchy, you'll find me singing these songs at random times. 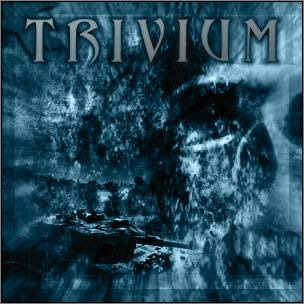 The solos are always awesome which makes Trivium have a better grade in my book. My favorite songs on this cd are Sworn and Demon. Sworn is fast and smooth, while Demon is a fist raising piece. I guess Trivium has something that grasps me tightly. I cannot stop listening to them no matter how many times I have in the past. So unless your a true fan of these guys and need to have all of their work this cd is pointless at the time. I've had it for a couple years now before their newer material was released. My review was just to point out that Trivium started out strong and supurb.